This design uses a traktor jet for propulsion, whereas I would like to use a conventional inboard diesel engine with shaft and prop. I also am not crazy about the way the bow looks on this skiff, and I would rather be somewhere around 19'x9.5' versus their 19'x8' beam. Through my searching of this forum, I know that there are several people here from Alaska. It seems plausible that someone on this forum may have built a variation of this skiff, or may know of another kit out there that is closer to what I am looking for. There are several companies in Alaska and Washington that build skiffs identical to what I am seeking, but they don't seem excited about selling a kit to someone who is trying to save a buck by welding up their own skiff. I'm not surprised a company that poured a ton of time and money into developing a good design would be reluctant to sell a kit or cut file for their skiff (that is until they heard an offer high enough to make it worth their while). Yes, I'm not surprised either. They would probably be concerned about people ruining their good name through building poorly constructed skiffs using their design. They may also be nervous about people welding their skiffs for resale, thus killing their own sales. With that said, Specmar is probably happy to get $3500 per unit for design services. I am happy to pay $3500, but would like another 1.5ft of beam and shaft/prop power. Maybe for an additional fee they could alter this design. I would think that Specmar would offer additional design services. I'm sure they could design you what your looking for. I'd say adding 18" beam to any design creates a whole new design unless you make the entire table of offsets grow by a similar multiplication? Even then the wt&Bal. will shift so the work to rebalance is about the same as new design? Add to a jet bottom to get a keel and shaft? Yes that is a new design - the engine, even if it had a jack shaft before - needs to move forward and that will redo the structural framing And the balance, so while I'm sure Specmar can do the work from white paper to cut files- I think 3500 is a bit low for that volume of work? I'd expect the design itself, after approvals and red-lining back and forth to be closer to 5k $ and the cut files to be another 4-6K depends on the level of interior framing that was required to hold the engine/shaft combination you've chosen in the previous design part of the hull design? Just my opinion on the costs of a new power tow skiff design and accompanying cut files. Don't know the costs of the market now, and I'm not selling anything here, just my take on what I'd expect to see in this level of design planning area of work. I'd expect you'll be involved more like 10k $ than 3.5k $ to get a new custom designed inboard w/shaft tow skiff? Will be interesting to see what you learn, where you decide to take your business and what your skiff needs to have to work well in your fishing operation? If you do get to the point of hunting design offices from scratch? 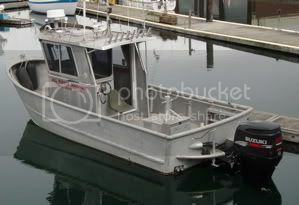 Please remember John Simpson of Vancouver; http://simpsonmarinedesign.com/ and Bill Lincoln of Response Marine; http://responsemarine.com/ as both are very well known as long term and quality aluminum work boat designers. We'd sure enjoy hearing about your progress and what you learn, what you decide and how you solve the current need to interact with a design firm to build your own welded metal seine skiff.